Jenna Marbles Top 5 Best Video: How Girls Fall Asleep & What Are This? How do I relax after a long day? My brain is too tired to comprehend a book, I’m too cheap to buy cable, and my couch is just so darn comfy. So, my coping mechanism as of late has been Jenna Marbles videos. Unfamiliar with Miss Jenna? I want to fix that. She’s an angel mouse, a beautiful woman, wicked smart, and has two cute pups named Kermit and Marbles. If you are really her friend, then you call them Kermie Worm and Meebles. Anyways, Jenna Marbles has some of the funniest videos on YouTube and if you binge watch them, it’s almost like a reality television series. 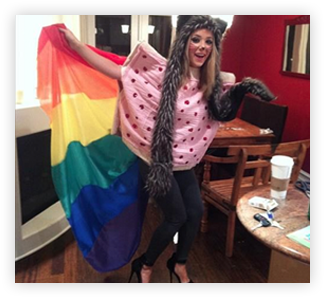 If you really want Jenna’s whole life story, let me present my number five favorite video: Draw My Life Jenna Marbles. So now you know everything about Jenna, including her break up with stud muffin Max No Sleeves. Max has a YouTube channel, but it’s mostly just a reminder that her learned a lot of his technique from Jenna. So, my number four favorite Jenna Marbles Video. It really ties with Zap Singing, so I highly recommend that one too. My number two favorite video speaks truth about the lives of women. “How Girls Pack a Suitcase” is really how almost every woman packs for vacation. She piles the stuff in, everything from underwear to Nerf Guns to a disco ball. What if we wanted to have a dance party? Drum roll please for the best Jenna Marbles video ever! “How Girls Fall Asleep” is exactly how I fall asleep. Honorable mention goes to “I Hate Being a Grown Up,” just because of the truth it tells. It really would have made the list, but you need to immerse yourself in Jenna Marbles before you see how funny parts of it are.